Contemplating an autopilot upgrade? SLOW YOUR ROLL! Reviving a “tired” original may be the smarter, more economical option. If you’ve been following my articles, you know that I believe an autopilot—even a basic wing leveler—belongs in any aircraft that intends to spend time in the clouds in IFR flight. The less time a pilot has spent in IFR conditions (e.g. a low time pilot with a fresh IFR ticket), the more an autopilot is needed. Cessna first introduced an optional autopilot in the 1962 172C model, and their choice of manufacturer for factory-installed autopilots and avionics was Cessna’s own division known as ARC. Aircraft Radio Corporation (ARC) got its start in 1924 and played a significant role in the development of early avionics. You may be aware of the famous flight by Jimmy Doolittle in a Consolidated NY-2 aircraft in which “blind-flight” was first demonstrated. That was possible through the efforts of ARC, Sperry, and others. ARC also went on to develop avionics used in military aircraft in WWII. Then, after the war, Cessna Aircraft Corporation purchased ARC and changed its name to Aircraft Radio and Control (thus keeping the ARC “handle”) and a whole new division of Cessna was created for the sole purpose of developing, manufacturing, and supplying avionics and autopilots to be installed exclusively in Cessna aircraft. Obviously, autopilot technology in general aviation aircraft (including ARC autopilots) has evolved since then. In this segment, we’ll identify Cessna “Legacy” autopilots and review their respective strengths and weaknesses, but let’s start with some autopilot basics. First, autopilots are available with single-axis (roll) or two-axis (roll and pitch). NOTE: Some autopilots offer a third axis or yaw damper (or separate yaw damper) option which is designed to compensate for excessive adverse yaw caused by aircraft design (as in the case of the V-tail Bonanza) or excessive turbulence. These are most often found in twins and charter aircraft to dampen yaw and make the flight more comfortable for passengers. Autopilots are also available as either rate-based (where the turn coordinator is the primary sensing device) or attitude/position-based (where the artificial horizon serves as the sensor for roll and pitch). There are pros and cons to both types. Turn coordinators are electric and considerably more reliable than a vacuum-based artificial horizon because a vacuum pump failure is more likely to occur than a total electrical failure. In short, an all-electric, rate-based autopilot has fewer pathways to an inflight failure. Today, all STEC autopilots are rate-based. On the other hand, attitude/position-based autopilots are reportedly “smoother” and better able to handle turbulence. Single-axis (roll only) autopilots keep the wings level and most can track an Omni, GPS, or localizer. Some, when linked to a directional gyro with autopilot interface (heading “bug”), can track a heading. This is a real nice feature if you spend a lot of time in controlled airspace where vectoring is frequent. Roll only autopilots, however, have no way to sense or control altitude. Conversely, two-axis autopilots not only provide full roll control, but they can also maintain a heading (with DG option), and hold an altitude. In fact, better two-axis autopilots offer additional altitude features like altitude pre-select and vertical speed control. Some even have glideslope tracking capability and, frequently, automatic trim—or at least an “out of trim” warning. It should be fairly obvious that the more sophisticated the aircraft, the more sophisticated the autopilot. These were ARC’s first attempt to provide a factory installed autopilot option to new Cessna aircraft buyers. Aside from their historical significance, these are “over the hill” and I only mention them because they represent the foundation on which Cessna based subsequent models. The Nav-o-matic 200 was a simple rate-based, single-axis autopilot using the turn coordinator. It could keep the wings level and track a nav source, but had no ability to maintain a heading. It did, however, have a unique memory feature that could maintain approximate direction (not exact heading) without a DG. The Nav-o-matic 300 was also a rate-based, single-axis autopilot with full tracking capability. However, it offered heading control when equipped with an optional autopilot DG or HSI. The Nav-o-matic 400 was Cessna’s first attempt at a two-axis autopilot pilot with altitude hold. The 400, unlike the 200 and 300, is a position-based autopilot that used a vacuum-based artificial horizon for roll and pitch sensing. The original 200, 300 and 400 (not to be confused with the “A” versions below) are not repairable in most cases, and to do so would be throwing good money away. If you have one of these in your aircraft and it’s still working, simply be cautious and don’t depend on it in IFR conditions. Having one of these is kind of like turning into clouds and then handing the yoke over to your 95-year-old uncle who has a bad heart. In the early ‘70s, Cessna introduced updated versions of their 200, 300 and 400 autopilots designated the 200A, 300A and 400A. Although functionality of the new models was pretty much the same as their predecessors, the new variations featured improved electronics and, more importantly, were a significant step up in reliability. In fact, these autopilots are still viable today with one exception—they’re “tired.” Simply stated, many of these autopilots installed in the ‘70s can still do a very good job of flying your Cessna aircraft. In some cases, they may actually do a better job than new (and expensive) modern options; and, in many cases they can be completely overhauled for anywhere from 1/3 to 1/2 the cost of a new, modern replacement! The Nav-o-matic 200A, like its predecessor, is a simple, rate-based, roll-axis autopilot. When “healthy,” it can do a great job of keeping the wings level, but for nav tracking it leaves a little to be desired. Of course, nav tracking is relative to the condition of your nav radios (including antennas and cables), which can affect the quality of the nav signal that the autopilot sees. The 200A had a unique memory feature that allowed it to maintain a direction (not to be confused with maintaining a heading). Heading control requires an autopilot DG, and the 200A doesn’t have this interface capability. Any way you look at it, the 200A had the edge in reliability over the previous 200. The 200A, if it meets your needs, can be completely overhauled and is worth repairing. The Nav-o-matic 300A, like the 300, adds the ability to interface to an autopilot DG (or HSI) and can maintain a heading. As mentioned before, this is a big deal if you spend a lot of time being “vectored.” In good shape, it will keep the wings level and maintain heading but, like the 200A, leaves a little to be desired when tracking a nav source. Unlike the 200A, you can add GPSS roll steering to the 300A (from DAC, Icarus, or by adding an Aspen PFD) and provide a significant improvement in nav tracking. One weakness in these systems, however, is button failure on the controller. There’s no new solution to this problem. Still, the 300A is a fine autopilot and repair or complete overhaul can be justified—if it meets your needs. As mentioned, you can normally completely overhaul a 300A for 1/3 to 1/2 the cost of a new, modern, equivalent. The Nav-o-matic 400A, unlike the 200A and 300A, takes us from a turn coordinator, rate-based autopilot to a position-based, two-axis autopilot with full altitude functions including altitude hold and glideslope coupling. The 400A gets heading info from a DG or HSI and can interface to a Flight Director. Auto-trim is standard. A mode selector is optional. It’s a very capable autopilot frequently factory installed in Cessna performance singles and light twins like 310s and 337s. It’s a good autopilot and likely to be safe and reliable as long as it’s maintained. Many are simply tired and as a result, their reliability is suffering. This autopilot is well worth repairing or completely overhauling. In a healthy state a 400A will fly a Cessna and, in many cases, fly it better than new autopilot models available today. The Nav-o-matic 400B was introduced by ARC in the later 70’s. This was a complete overhaul of the 400A and included a newly redesigned computer and electronics. The result was a modern, sophisticated autopilot for Cessna that has proven to be very reliable. If you have a 400B in your aircraft, it’s certainly worth repairing or overhauling. Like the 400A, the 400B offered an optional mode selector that gave the pilot fingertip control of the autopilot’s features. NOTE: Cessna also offered an 800 and 1000 series autopilot. These were more complex and consistent with the needs of pilots flying Cessna heavy twins. They’re good units, but they’re also very complex. If yours is in need of repair, you need to find a shop that really knows these systems. By the late ‘70s, Cessna noticed that aircraft buyers were opting for autopilots from other manufacturers like Sperry and, ultimately, elected to sell ARC to Sperry in 1983. Shortly thereafter, Sperry suspended production and, in 1987, sold ARC to Sigma-Tek. From that point forward, Sigma-Tek took on the primary role of parts support for ARC avionics and autopilots. However, though support for ARC products continued, new production of ARC autopilots and avionics ceased. The dominant autopilot manufacturers in 1987 were Bendix King (OEM), Century Flight Systems, and STEC (aftermarket). It should also be noted that at that time the ARC autopilots generally received better marks from pilots than ARC avionics, and Bendix King offered the more desirable avionics products. Aware of this fact, it should come as no surprise that Cessna would soon align themselves with Bendix King’s avionics and autopilots. No matter which autopilot you have, whether ARC or whatever, it’s important that you know everything about it—and know it well. This may seem obvious, but it’s not. Your aircraft has a flight manual that should include everything you need to know about your autopilot. However, many shops that work on autopilots shockingly report that they often encounter aircraft owners who have actually never read the Flight Manual Supplement for their autopilot! 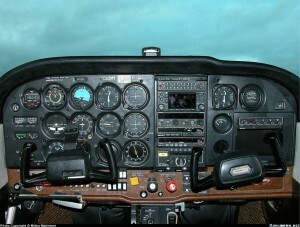 Most autopilots have (or should have) a disconnect switch on the yoke. Things can go sour quickly and this is the quickest way to stop your autopilot from causing it. Be sure to test this switch regularly to make sure it works. The on/off switch on the autopilot’s controller. Pulling the circuit breaker should render the autopilot null. I recommend marking or otherwise identifying the autopilot’s circuit breaker so you can find it quickly. Also, make sure that your circuit breaker can be pulled—some of the early ones can’t. Initially, you will try “fighting” with the autopilot; and fortunately, most autopilots must be able to be overpowered in order to get certified. However, mechanical systems can fail, so you’ll want to minimize the time you fight with the autopilot and the quickest way is to disengage. All airplanes have trim systems. Two-axis autopilots with altitude features (hold or whatever) typically have an electric trim system. Many have auto-trim which, as the name implies, automatically trims the aircraft to minimize extra forces on the elevator or trim tab from “out of trim” conditions. Electric trim systems (without auto-trim) have a feature called trim prompting in which a sensor in either the trim servo or cable system detects excess pressure and “prompts” the pilot (with an annunciator light) to re-trim. Even manual electric trim systems can fail, but a failure in an auto-trim system creates real problems and leads to accidents. The following is an example of just the type of scenario that you must avoid. Again, the message here is to always disengage first! The autopilot suddenly goes into a nose down situation. The autopilot and auto-trim are engaged and the pilot reacts by applying backpressure. Unless the pilot immediately disconnects the autopilot, autotrim does its job by further applying down trim, and as you can imagine, things can get ugly fast, especially at low altitude. And, don’t just use your autopilot in IFR conditions. Use it frequently and respond quickly if you see any anomalies in the autopilot or trim system by communicating these to your aircraft and autopilot mechanics. This is not the place to try to save money. We talked about rate-based vs. attitude/position-based autopilots. Rate-based systems use the turn-coordinator, which is electric in all modern aircraft and is considerably more reliable than the gyros used on attitude/position-based units. A total electrical failure, even in a single engine aircraft is not very common and you get many more hours of service from a turn-coordinator than you do from attitude gyros—either vacuum (as most are) or electric. When you first turn on your master switch, the spooling up sound that you hear (before engine start) is your turn coordinator, and frankly, when they are on their way out, they “scream” at you. You’ll want to get that taken care of quickly—especially if you spend time in IFR and depend on your rate-based autopilot. Conversely, vacuum gyros used in attitude/position-based autopilots are not so quick to inform you of their pending failure. First of all, you’ve started your engine and it’s much harder to hear your vacuum gyros. Secondly, by nature, a vacuum attitude gyro is not only vulnerable to its own condition, but it’s vulnerable to the condition of your vacuum pump and filter, and a failure of either will render all of your vacuum instruments inoperable, including your autopilot. Moreover, attitude gyros are subject to bearing wear as well. Generally, as they slow down they will start to tilt and your attitude-based autopilot will follow. Your vacuum gauge will not reflect this so you must pay attention. Modern autopilots will normally disengage, but the older ones may not. While we all appreciate the benefits of wings level in IFR cruise, we also understand the dangers of thinking you’re level when, in fact, you’re not! Now is a good time to introduce my “mentor” for this article, Bob Ferguson of Autopilots Central, Inc. (www.autopilotcentral.com) in Tulsa, Oklahoma. For years, Bob has maintained a very solid reputation for his autopilot expertise. As an avionics consultant with APG Eastern Avionics, I’ve frequently found Bob to be a very good source for autopilot advice, parts support, repairs, and overhauls—especially with legacy autopilot systems. With the exception of pre-1970 autopilot systems, Bob agrees that most legacy autopilots still have value, but as I mentioned early on, they’re getting “tired.” Cessna “A” series units (200A, 300A, and 400A/B) for example, have been in the air for 40 years, and many are just fine. Many, others, however, require frequent repairs and should probably be completely overhauled. Bob reinforces my opinion that you can typically overhaul one of these systems for anywhere from 1/3 to 1/2 the cost of a new replacement, and when you’re done you’ll have a reliable autopilot that may actually fly your Cessna better. Most pilots, however, just pick away at repairs and solve the “problem of the day.” Sadly, this is what gives legacy autopilots a bad name. On a related note, if your autopilot is tired, there’s a good chance your airframe and rigging is too. Autopilot technicians frequently find that an issue with an autopilot is often the result of poor aircraft maintenance. For instance, static systems with old plastic tubing that literally breaks in your hands will absolutely affect the performance of the altitude portion of your two-axis autopilot. The fact is most airplanes haven’t had their control system rigged or cables tightened in years! You’d be kidding yourself if you don’t think such neglect will cause pilot frustration in an aircraft with an otherwise normally operating autopilot. Autopilots should be aligned after any repairs or parts replacement. This is frequently not done and can result in a “balky” autopilot. Speaking of frustration, when it’s time for autopilot repair or OHC, do your homework and take your aircraft to a shop that is qualified on your autopilot, especially if you have an older legacy system. Your local avionics shop that installs STEC systems may simply not have a handle on older Cessna autopilots and that’s not going to help your autopilot repair budget—or lower your blood pressure. You may have to travel a bit to get your aircraft in the hands of a shop that has the knowledge and experience to help you. Use the tools you have available to you (like forums and the Internet) to get a sense of where you need to go to get things right. On that subject, don’t just walk into an autopilot repair facility and tell them your autopilot doesn’t work. You need to first know your autopilot and its functions and be able to identify specific functions that are not performing. Otherwise, you’re just wasting money while your tech “blindly” searches through the system looking for flaws. As I have frequently mentioned in my articles, the cost of flying your own private aircraft has continued to rise and at the same time, aircraft values (which went crazy!) are dropping. An autopilot plays a very important role in single pilot IFR flight and, unfortunately, the cost of maintaining your autopilot, especially poorly maintained or tired old “legacy” units, can be significant. Most pilots take the more expensive route to autopilot maintenance which is to fix “today’s problem” as opposed to biting the bullet and going for that complete autopilot overhaul. The challenge of budgeting for an autopilot overhaul is only going to grow as pilots struggle with the pending ADS-B mandate. A wing leveler in a VFR aircraft is nice, but a complex autopilot in an IFR platform is an important tool and more than a luxury item. Its role to minimize pilot load in IFR can’t be overstated. Restating the overriding message behind this article, owners must properly maintain their plane’s autopilot if they are using it as an IFR tool. And, too many pilots are discarding good autopilots without understanding the financial benefits of a total rebuild vs. new replacement. I can’t emphasize it enough—piecemeal repair of legacy components is the expensive way! I’m regularly on the Cessna Owners Forum ready and waiting to help you with your avionics issues. Until next time…Happy and Safe “hands-free” flying!